I won’t lie… I’m a search engine geek. Since discovering SEO 2-3 years ago, I have gradually yet increasingly become more passionate on the subject. And as anyone who’s passionate on a subject will attest to, every subject and/or industry has its experts and its heroes. 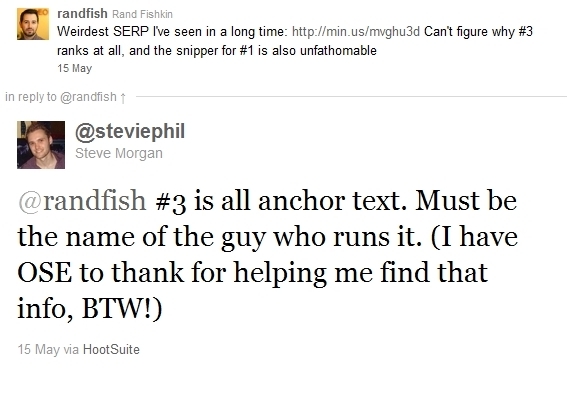 I have a few, one of them being Rand Fishkin of SEOmoz. 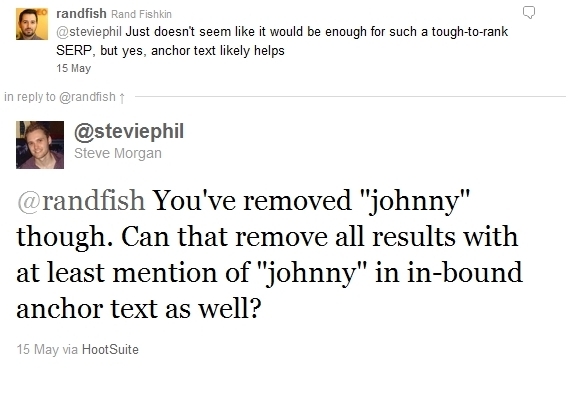 Although Rand agreed with my theory, he still wasn’t convinced that “it would be enough for such a tough-to-rank SERP.” I replied asking if he thought that perhaps negative/removed keywords could affect the anchor text of in-bound links as well as the on-page text. At this point, I was tempted to leave it be, but after thinking about it for a while, I decide to look into it some more. Before Rand had the chance to respond, I took a deeper look into it and drew a few conclusions. To my delight, Rand responded positively and enthusiastically. The next day, I detailed my findings in a post for the Liberty Marketing blog. Although arguably a bit cheeky on any other occasion, I notified Rand of the post’s existence, seeing as we’d discussed it the day before and I thought that he’d be interested. The result? Rand didn’t retweet my notification, but tweeted about it in its own right, mentioning me in the process, which was probably better than retweeting my tweet (it was certainly more presentable than what I’d written to him). Compared to other tweets, this one didn’t start with “@steviephil,” meaning that it wasn’t sent solely to me… Instead, it was addressed to his followers. All 30,000+ of them. For someone who loves SEO, loves learning new things (especially something that no one’s ever documented or picked up on before) and who also looks up to Rand and what he’s achieved in the industry, this was a huge honour. I was ecstatic. Rand’s tweet saw the Liberty blog and the website as a whole get a ton more traffic than usual. Unfortunately I don’t have access to Liberty’s Google Analytics account as I type this, although you can picture the graph: a huge peak on the date of the post, with a drop in the days afterwards. I may not have Analytics access, but I do have bit.ly account access, and I can tell you that this particular blog post had 30 times the clickthroughs compared to the blog’s other recent posts. We couldn’t believe it! Okay, so admittedly, although the volume of traffic was great, one can argue that the traffic was probably primarily made up of other SEOs, and although that’s still cool from a relevancy point of view (e.g. they may then go on to browse other news and advice posts we’ve written), they’re hardly our target market. We want business owners to check out the Liberty site – they’re the ones who enquire and hire us for our services, not our industry peers. Links: The blog post has acquired more in-bound links than some of Liberty’s other blog posts, probably because more people saw it, offering more of an opportunity that someone would link to it. 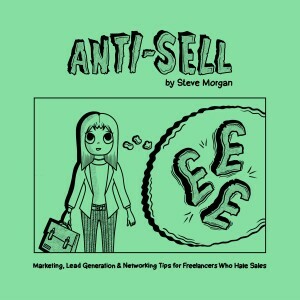 Also, being mainly industry peers, SEOs – many already owning blogs and knowledgeable about linking – are probably more inclined to link to it than other people. Not only that, but we might also have a legitimate and genuine Wikipedia link opportunity, what with is being an industry discovery and research. 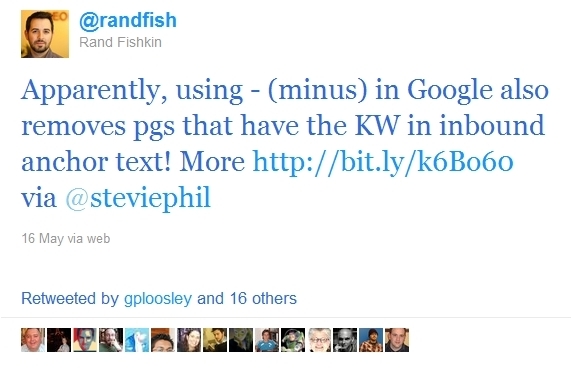 Retweets: Old and new-style tweets combined, Rand’s tweet was retweeted about 20 times. Although the sharers themselves might have mostly been made up of industry peers, their followers may not be. 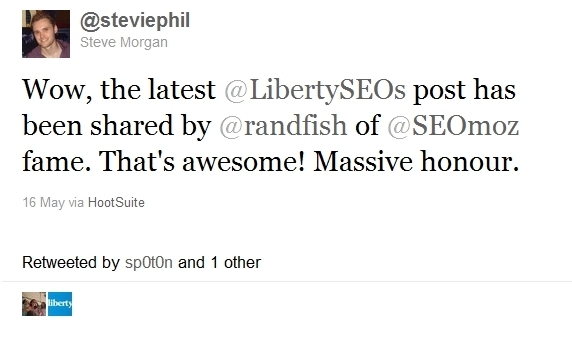 It’s not impossible that one or more of the retweeters was an SEO agency or freelancer in the UK, who has followers that might benefit from Liberty’s services, the retweet along with the link to the blog post now putting Liberty on their radar. New Followers: Both me and Liberty earned a few more followers as a result of Rand’s sharing, some of whom have hopefully continued to follow us for future tweets and updates, both business and SEO-related. Pride: In my excitement, rather than retweeting Rand’s tweet, I tweeted about the whole thing separately, giving me a chance to word it how I wanted (a bit like Rand not retweeting my notification but putting it in his own words instead). It gave me the opportunity to call it a “massive honour,” while linking to the Twitter profiles of Liberty, Rand and SEOmoz, all in one tweet. Liberty shared it, as well as Liberty’s PR agency, making it more widely accessible to our more local contacts. Authority: Linked to the above point (especially in terms of Liberty sharing the tweet), it helped to strengthen Liberty’s authority and standing in the SEO industry. By discovering something like this, we are showing that we know what we’re on about and know what we’re doing. This should give comfort to clients – present and future, current and prospective – to give them confidence in our abilities, skills and knowhow. Recognition: Now that Rand has seen what I/we can do, it might be easier to do something like this again, with him sharing another discovery. It’s like a foot in the door, with it being not impossible that he might remember and recognise me in the future, especially as I have started to comment on a number of SEOmoz blog posts in my own right (and with the fact that I currently use the same avatar on my SEOmoz profile as I do on Twitter). Networking: I’m a member (and a big fan) of BNI. It’s given me another thing to talk about and to tell people – in my opinion, saying “we taught an expert in our industry something new” is as impressive as saying “we helped to get a website higher in Google.” Although very few people in my chapter will know who Rand is (and that’s fair enough), they can always look into it afterwards, plus some people in related industries may already know who he is (e.g. 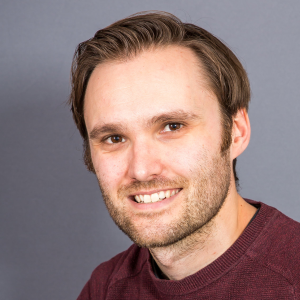 web developers and social media specialists – I may not be a dedicated expert in either area but I’ve still heard of some industry experts in both areas). I can’t see this type of thing working for everyone. I do think I was extremely lucky, in noticing and responding to the tweet and in taking the time and initiative to investigate and then write about the issue. A big risk is the person taking the credit for the discovery themselves. 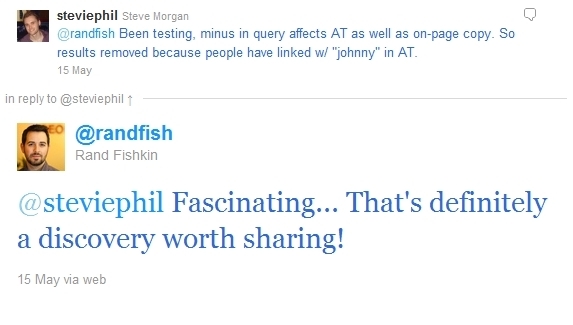 Given Rand’s standing in the industry and his morals and views on sharing with others, I knew Rand wouldn’t do such a thing (“that’s definitely a discovery worth sharing” was almost his way of saying “you should tell people about it”), but that’s not to say that everyone would necessarily follow his example. Alternatively, they might simply not share it. 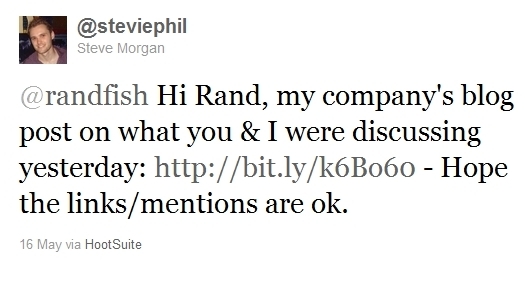 Rand might have not bothered to pass on the tweet, even with my nudge/notification to him. Or they might not share it properly – I was lucky that Rand @mentioned me in the tweet as well as linking to the blog post, but others might only do the latter. Which brings me onto a big point – not everyone is familiar with Twitter and not everyone uses it. It may differ from industry to industry, with Rand in SEO being a regular Twitter user, while an expert in another industry simply doesn’t touch it. However, for those who do, there is no harm keeping an eye on what they say and jumping on an opportunity to help them if they want feedback, advice or someone’s input – it sure worked well for me.